Last September, Italian physicist Alessandro Strumia gave a bizarre lecture at CERN in which he argued—to an audience of young women scientists—that women are less qualified to conduct physics than men. On Thursday, CERN officially severed its association with Strumia. The workshop, hosted by CERN (the research organisation in charge of the Large Hadron Collider), was supposed to focus on gender issues within the world of high-energy physics. Strumia, who conducted research at CERN via a grant from the European Research Council, was one of over 30 scientists scheduled to give a short presentation. The talk was ostensibly about gender differences in the citations doled out in studies. Strumia did present data showing that men got more citations as their careers advanced, but then proceeded to argue this meant women were simply less capable at physics. 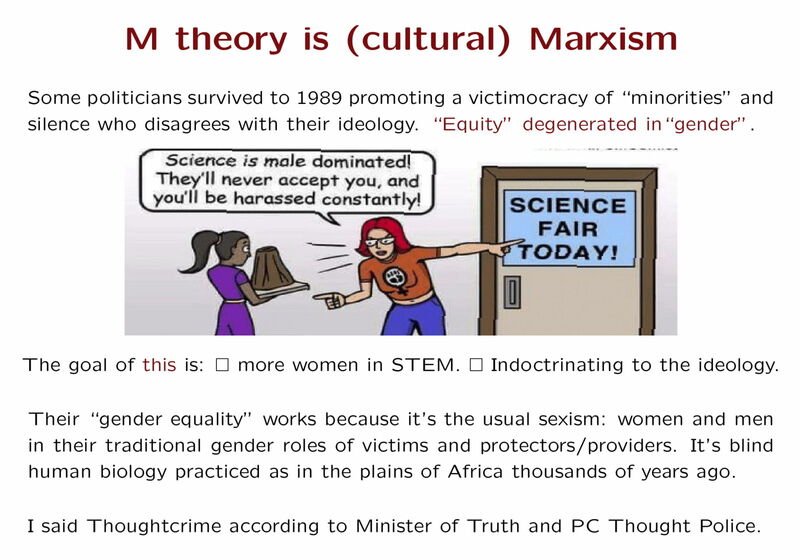 He also claimed that there is no sexism in physics, whined about women scientists getting top positions over better-qualified men—using an anecdote about his own failure to get a certain position as an example—and warned about the dangers of “cultural Marxism.” And all with the help of slides that wouldn’t look out of a place on a 4chan thread. It wasn’t long after Strumia’s talk received media attention and criticism that CERN admonished him. By that Monday, it had removed his presentation from its website, suspended him from any activity associated with CERN, and promised to carry out an investigation into the event. In January, Strumia’s employer, the University of Pisa, issued a public sanction against him for his actions. And this Thursday, CERN formally broke up with Strumia. “As a result of its own investigation and following the decision taken by the University of Pisa, CERN decided not to extend Professor Strumia’s status of Guest Professor,” CERN said in a statement. Despite the snub, Strumia told the BBC that he was fully standing by his tirade. “Science is not about being offended when facts challenge ideas held as sacred,” he said. Of course, plenty of scientists had discredited Strumia’s arguments on their scientific merits alone. Marika Taylor, a theoretical physicist at the University of Southampton and part of the organising committee for the CERN workshop, told Gizmodo at the time that the event’s organisers were aware beforehand that Strumia might use his talk to argue that women are worse at physics. But Taylor insisted that they had no idea how far he would take it. “The actual presentation was not uploaded ahead of time. The content and delivery was unprofessional and violated codes of conduct,” she said. Strumia’s official ousting by CERN was lauded by the women scientists who first publicised his talk on social media. “The recent statement is a powerful message for scientists all over the world; irrespective of your status, you will be held accountable for your actions,” Jessica Wade, a physicist at Imperial College London who also presented at the workshop, told the BBC.